Add everything in a large bowl except water and butter. Roughly mix. Add water and butter, start mixing. Keep mixing till the dough forming smoothly. Flour a clean surface for kneading the dough, transfer the dough to the surface. Flour or grease a bowl, put the dough in, cover with cloth or plastic wrap. Leave it in a warm place, let it rise for 45 minutes. The dough will almost double its size. While the dough is rising, grease a baking pan. Take out the dough and back to the floured kneading surface. Punch the dough down and squeeze out all the air. Knead for another 1 or 2 minutes. Make into a bun shape. Put the dough in the greased baking pan, cover with cloth and let it rise for 15 minutes. While the dough is rising, preheat oven to 180°C. After the dough is done, use a knife, cut an “X” mark on top. Bake in oven around 40 minutes. When it's done, the bread is golden brown. Take the bread out of the oven. Let cool before cutting. 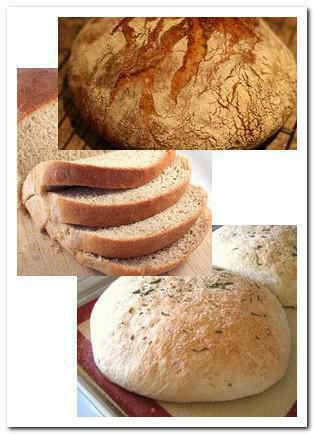 A basic and easy bread recipe. Homemade bread freshly from the oven, the great aroma gives you a warm feeling. Meanwhile, you can enjoy the interesting process of kneading and dough rising.